Saoirse Ronan and Margot Robbie square off in a costume period piece that should be more exciting than it is. How much fun would it be to watch an alternate version of ‘Game of Thrones’ in which all the boring men cowered behind trees while two female dragons circled overhead? You may be wondering about that while taking in ‘Mary Queen of Scots’, visually dull and intriguing in only the most generic sense, but still a showcase for the twin talents of Saoirse Ronan and Margot Robbie. For their royal viciousness alone, the movie is almost worth seeing, even if the backbiting is nowhere near as killer as ‘The Favourite’ (it’s a good time to be an onscreen monarch). Technically, this is Ronan’s movie: She plays the titular role, Mary Stuart, estranged from her native Scotland, reared Catholic in France and already widowed as a teenager. In 1561, Mary is returning home to a mess of competing claims to power. For all the soulfulness Ronan has summoned elsewhere – her performances in ‘Brooklyn’ and ‘Lady Bird’ are worthy of the silent era’s most iconic turns – she’s a little stiff here, uneasy in the saddle, and wasted on moments of grandeur and hot-blooded pronouncements. Fortunately, ‘I, Tonya’s Robbie is happy to pick up the slack as England’s ruling Elizabeth, cursed with bad skin, worse wigs, defective ovaries and a scheming cousin in Mary. They’re rivals, but the script (by Beau Willimon, based on John Guy's 2004 biography) awkwardly constructs only one scene for them to play against each other. No matter: Long before the verbal fireworks of that final showdown, Robbie is exuding loneliness and fury in her gilded cage. Director Josie Rourke points out their differences a bit too obviously: Mary’s bedsheets are covered in postnatal blood while Elizabeth has only decorative paper ribbons spread out before her. Even so, the shared fertility psychodrama is fierce. I wasn’t expecting a barrel load of laughs from this already well covered era between Elizabeth I (Margot Robbie) and the Stuart usurper Mary (Saoirse Ronan). It was slow and difficult to follow even for me who had a superficial but possibly helpful knowledge of events. The cinematography was excellent and the rigours of life in Scotland in those days was graphically illustrated in internal and landscape scenes. North of the border was cold, damp, bleak and life was hard. Nothing much changed there then in the intervening centuries. Lots of men with beards shouted vehemently at each other it was difficult to remember who was who and whose side they were on. The main event, one could argue, the plot against Elizabeth when Mary literally got it in the neck, was skated over almost as an afterthought. Heavy and turgid and not appealing at all to this cinema-goer. Stories about our country's history are usually worth a watch and indeed this becomes more and more engrossing as we delve into the soul of each Queen. The innermost struggles that each has against what she really wants and what's "best for the country". No light touches here. It's all intrigue, deviousness and malicious plot. The script didn't allow me to feel enough empathy for either main character, unfortunately. But the performances were certainly majestic. There have been a number of fine dramas examining the relationship between Mary Queen of Scots & Elizabeth the First. Unfortunately this isn't one of them . This production is flat, tedious, totally uninspired & full of really wooden performances. What went wrong ? 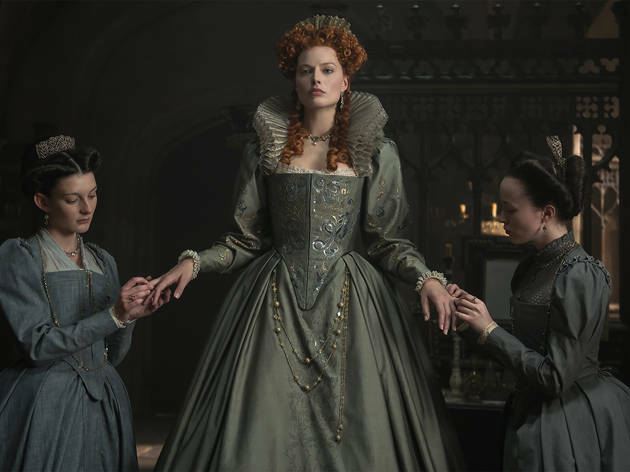 Saoirse Ronan (Mary Queen of Scots) and Margot Robbie (Elizabeth 1st) play their parts well enough. There is no real sparkle but it brings their story to life more clearly than the books. Following the early death of her French husband, Francois, Mary comes back to Scotland as queen and tries to overrule the multitude of high-ranking men and their similar egos.She makes the mistake of marrying Darnley who, it quickly appears, has a rapacious appetite for alcohol.Battling a constant power struggle with her cousin, Elizabeth 1st ,Mary, as history tells us, meets her untimely end with her head on the block.The costumes are wonderful, the scenery is very er ... Scottish, but the excitement and frisson that might have been incorporated is never really there.